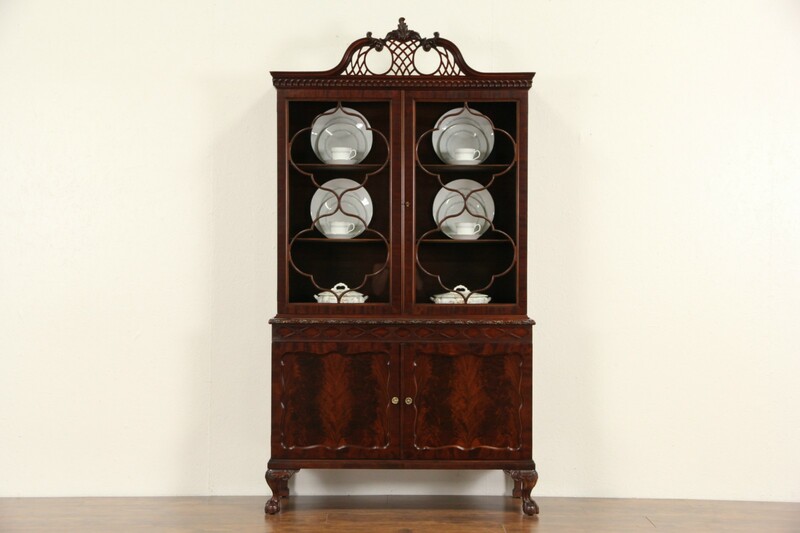 This classic Georgian style china display cabinet or bookcase is about 60 years old, and was made by famous maker, "Romweber of Indiana." Note the graceful design with finely detailed classic ball and claw feet. The finish is in excellent condition with matched flame grain mahogany on this American made vintage furniture. There is a slight warp to the bottom right door, see photos. Upper doors have a working lock, shelves inside have grooves to display plates. The Romweber signature is lost on this piece, it remains on the sideboard. Measurements are 44" wide, 17" deep and 6' 8" tall.